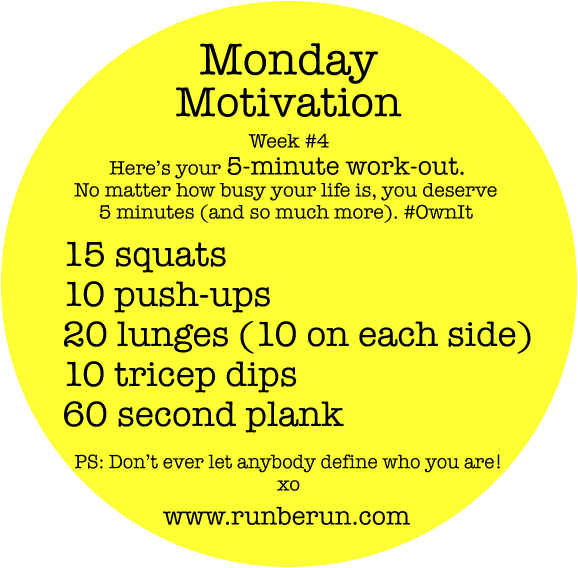 Here’s to finishing December strong and reminding ourselves why fitness is so fundamental to who we are. After all, aren’t we better versions of ourselves when our bodies are in motion, sweating, and flying high on endorphins than when we’re sedentary, working too many hours or simply managing our daily lives? I know I am. I’m more patient, grounded, focused, optimistic, and energetic. That’s why no matter how crazy life gets, I will always carve out time for exercise. 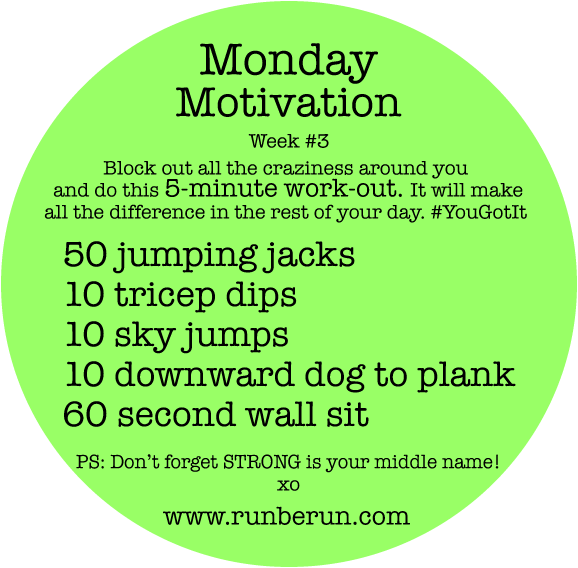 For fun this Monday morning, care to join me in doing all five of these December 5-minute work-outs in a row? There’s nothing like finishing strong! Start on Week #5 and work backward (the other links are below). Go!!!! Then swing back and tell me how you did. December is turning into one big, beautiful blur of holiday cheer…something I love, yet also struggle with as I battle to maintain health and fitness in the midst of all this “special-ness.” Special food, special parties, special “secret shopping errands”…the list goes on and the hours in the day never grown any longer. Here’s to making fitness just as special as all the other “special-ness” and carving out time to fit it in…NO.MATTER.WHAT. I‘d love to know how you are all managing this time of year! Are you thriving? Being consistent and making fitness a priority during this time of year can be a challenge (to say the least), but it’s also a great opportunity to change it up a little and focus on fundamentals. Keeping it short and sweet and making it doable will not only add freshness, but fun. Most of all, it’s important to find balance so you have time to savor the holidays instead of just survive them, and still feel good because you haven’t completely neglected your health. I’ve decided to keep it simple and do what I can, when I can, this month and celebrate each little victory along the way. In between taxi’ing my daughter to all her Nutcracker ballet rehearsals, coaching, shopping, party-planning, house-decorating and occasionally donning my domestic goddess hat, I’m simply squeezing in 3-6 mile runs (or cross-training equivalents) every other day and throwing in some weights and 5-minute work-outs along the way, like the one below. So far, the balance feels right. How are you staying on track this month? 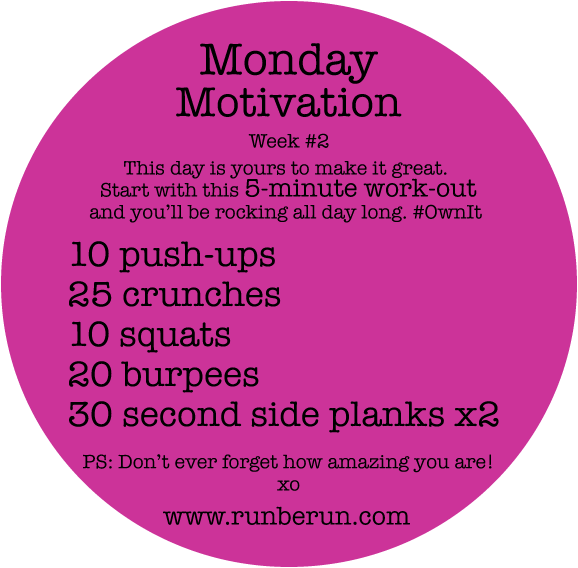 What are your go-to work-outs? 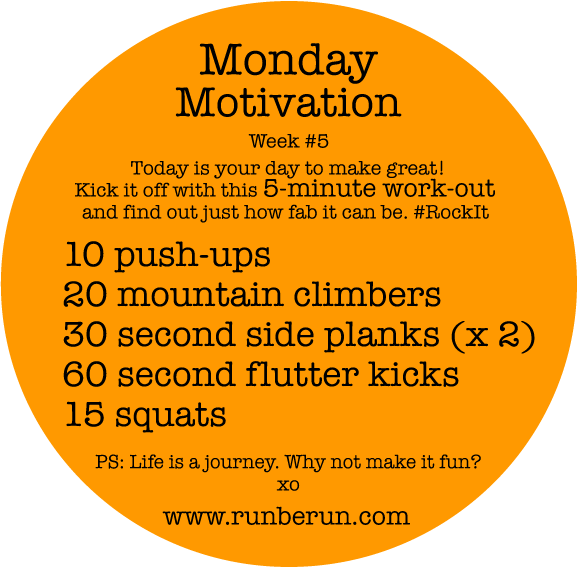 And how do you like these 5-minute work-outs?